Horncastle Town will face a dress rehearsal of their county cup final this Saturday - with manager Mickey Stones telling his side they have ‘nothing to lose’. 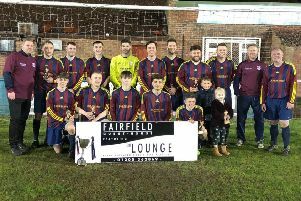 The Wongers travel to Lincolnshire League highfliers Brigg Town CIC this weekend, just six days before the two rivals are due to meet in the final of the Mason Bros Lincs Junior Cup. This Saturday will be the first time Town and the Zebras have met since the opening day of the season, when they played out a 1-1 draw. Since then the two rivals have had differing fortunes, with Brigg sitting second in the table and the Wongers ninth. With that in mind, Stones admits he found himself questioning how to approach this weekend’s league clash so close to the cup final date. “We were saying we weren’t really sure how to approach it on Saturday,” Stones told The News. “We have a gameplan, how we want to play in the final. This weekend’s contest has more riding on it for the Zebras, who are looking to claw back the five points they trail leaders Lincoln Moorlands Railway by with four contests left to play in the league season. Horncastle, on the flipside, cannot be caught by the bottom three and feel they have nothing to lose and everything to gain at The Hawthorns when the two sides meet. “It feels like it’s a bit of a free one,” Stones added. “We can’t drop lower in the table so it’s an opportunity for whatever team we pick to play football and have a go without any nerves. Kick off at The Hawthorns will be at 3pm. The two sides will then meet the following Friday (April 12) at Skegness Town’s Vertigo Stadium (KO 7.30pm) in the county cup final.